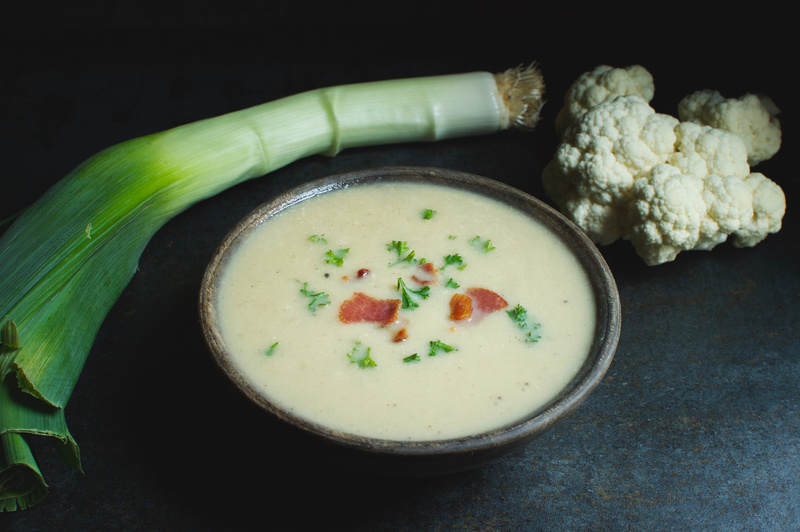 This Low-Carb “Potato” Leek Soup is a Paleo, low-carb, and dairy-free comfort food. No one will know this soup is made with cauliflower and not potatoes. This recipe was originally released on February 11, 2016. In fact, it was one of our very first recipes. I love this recipe, and others love it too. However, our blog has grown so much since we started that I decided to rework it a bit. First of all, I made the ingredient quantities more clear. For example, instead of saying a head of cauliflower, I say a pound of cauliflower. I found that weight variations in cauliflower heads made the results of the recipe less predictable. I also made a few changes to lower the carbs. To keep the thickness of the soup even though I reduced the amount of onions, I pureed all of the veggies, including the leeks. I added the nutritional information to make it easy on my followers. 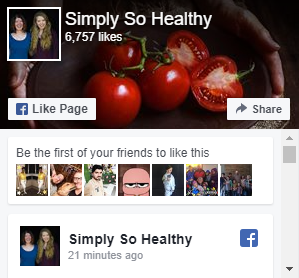 When we first started blogging, we didn’t put in nutritional information for any recipes. I am slowly trying to add it when I have spare time. I have realized that this information is important to much of our audience. Finally, I updated the photos. 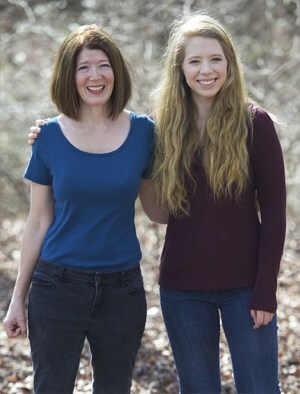 It took some time to develop our photography skills, so many of our earlier recipes could use a face-lift so they look more like the rest of our blog. Shhhhh! Don’t tell anyone! This delicious low-carb, Paleo soup is actually made with cauliflower, not potatoes, but don’t worry, your family won’t notice. Instead, they will be ladling out second helpings. 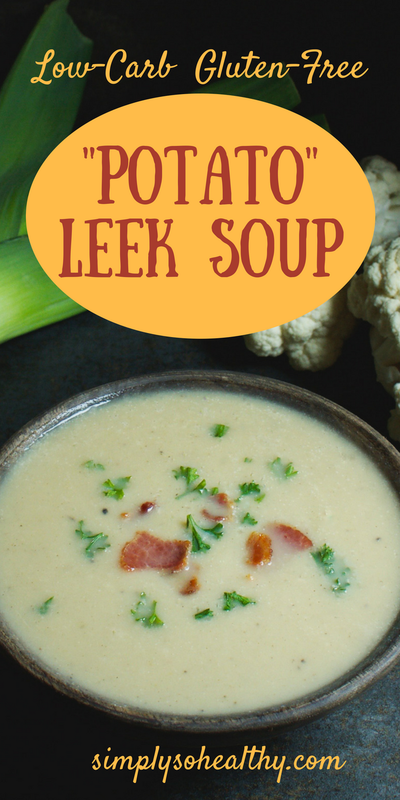 My potato leek soup was a favorite of everyone in the household. Unfortunately, potatoes are not low carb so I’ve had to re-work my recipe a bit. Cauliflower has stepped in and been an fabulous replacement. Not only does it make it low-carb, it also adds cancer-fighting and anti-inflammatory compounds. 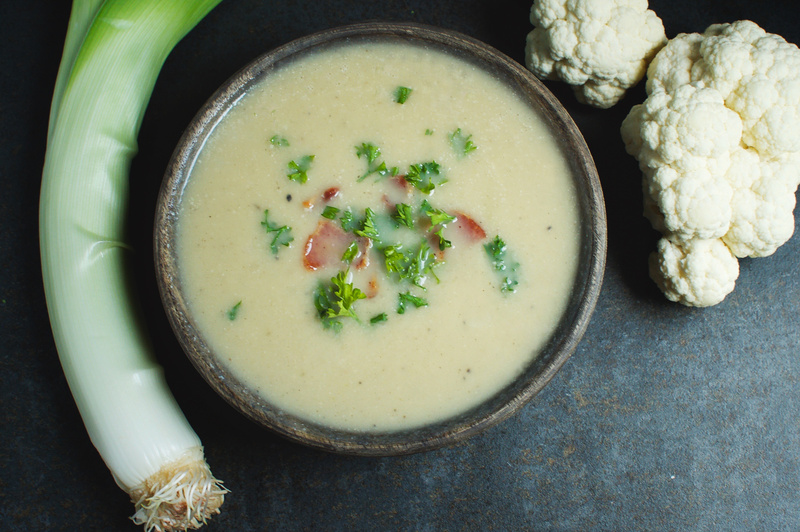 Thanks to cauliflower, this soup has regained its place as a family favorite. I use my own stock for this recipe. For my stock recipe, click here. Purchased stock/broth could also be used. In fact, I have been know to use it myself in a pinch, but I love the nutrients and flavor of the homemade stuff. 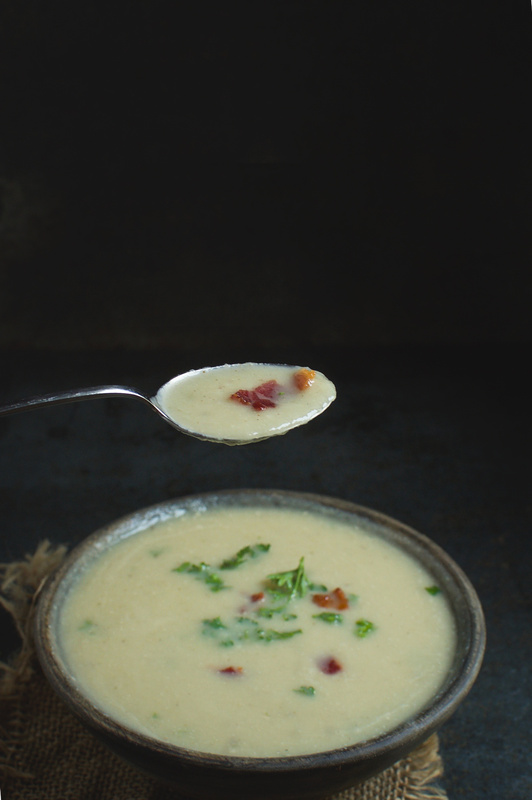 The thyme, bacon and leeks add extraordinary flavor to this velvety soup. The bacon adds a rich smokey flavor, a perfect combination with the leeks and the thyme. Be sure to use uncured bacon from pastured pigs. 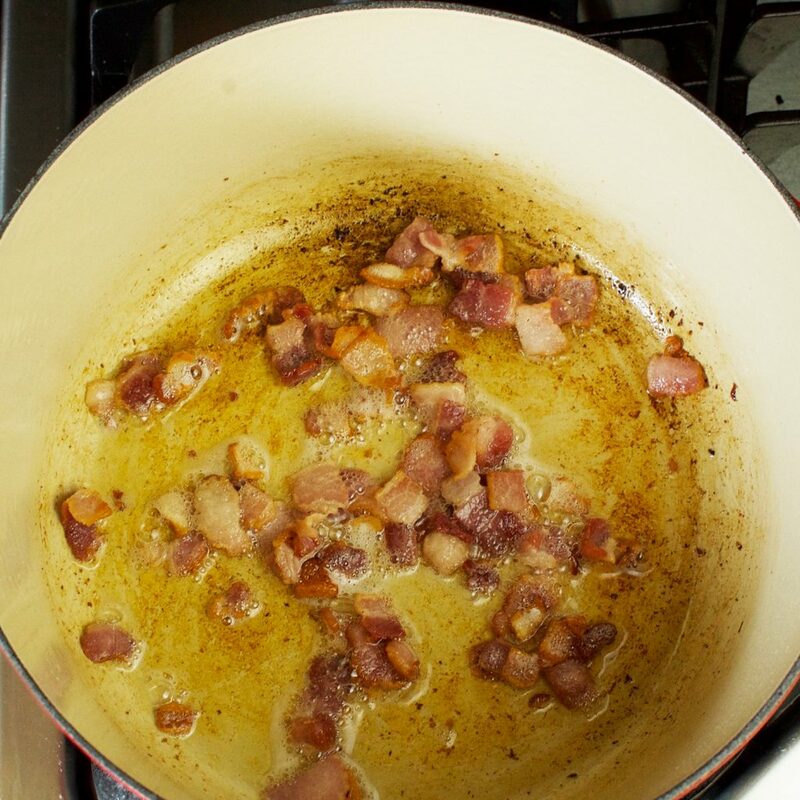 It is possible to leave the bacon out and use butter, ghee, or coconut oil to sauté the onions. Of course, the end flavor will be altered. I use the bacon. Enjoy this “potato” soup recipe. Your secret will be safe with me! This soup is a Paleo, low-carb, and dairy-free comfort food. No one will know this soup is made with cauliflower and not potatoes. 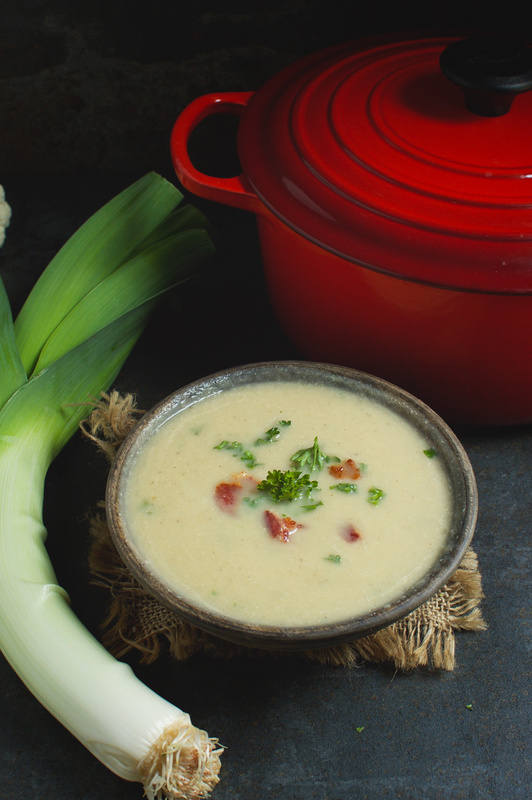 The thyme, bacon and leeks add extraordinary flavor to this velvety soup. 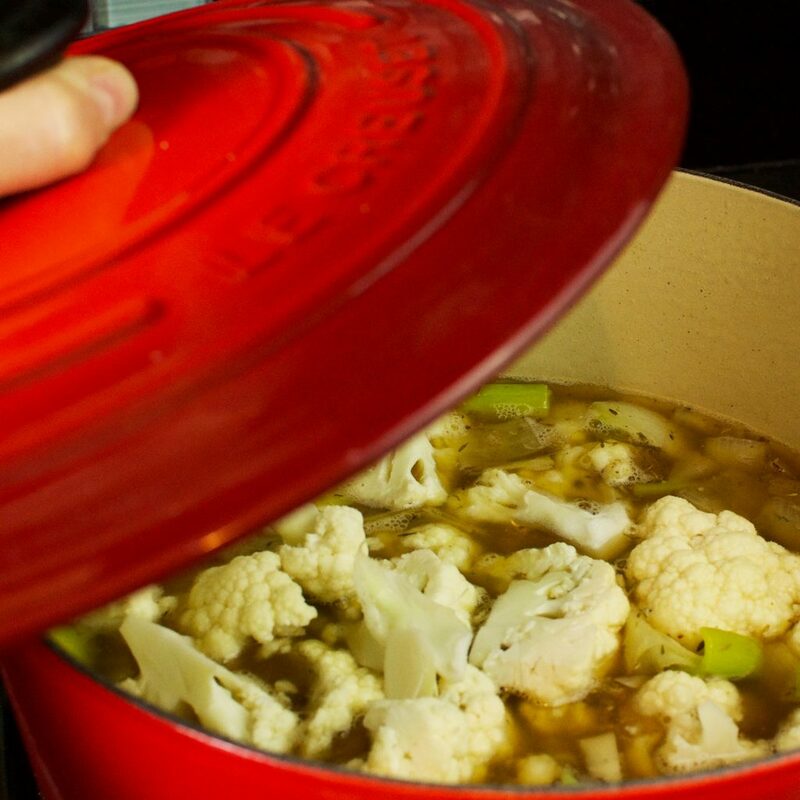 Heat stock pot or dutch oven over medium high heat. Add bacon and cook, while stirring, until crisp. Remove bacon from pan and drain on plate. Reserve bacon for later. Discard all but one tablespoon bacon grease from stock pot. Place pot used for bacon over medium heat. Add onion and leek. Sprinkle lightly with salt and pepper. 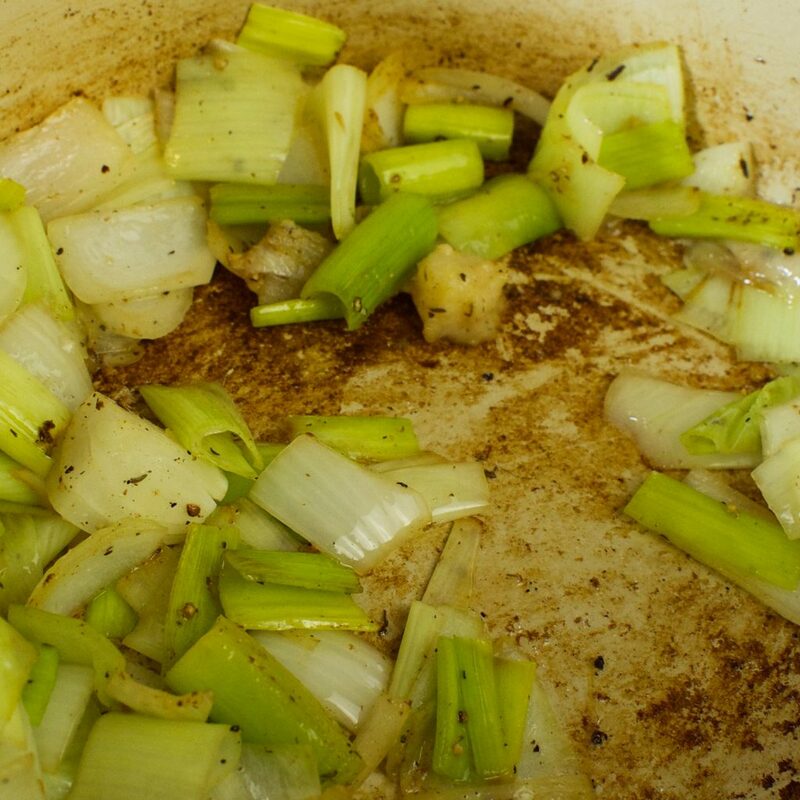 Cook onion and leeks, stirring occasionally, until edges begin to brown and the onions appear translucent. Add garlic and dried thyme to onion. Cook for one minute. Add 1 quart of chicken stock. Heat on high, stirring occasionally until stock simmers. Add cauliflower and cover pot. Using high heat, return to a simmer. Once soup comes to a simmer, turn heat to medium low. 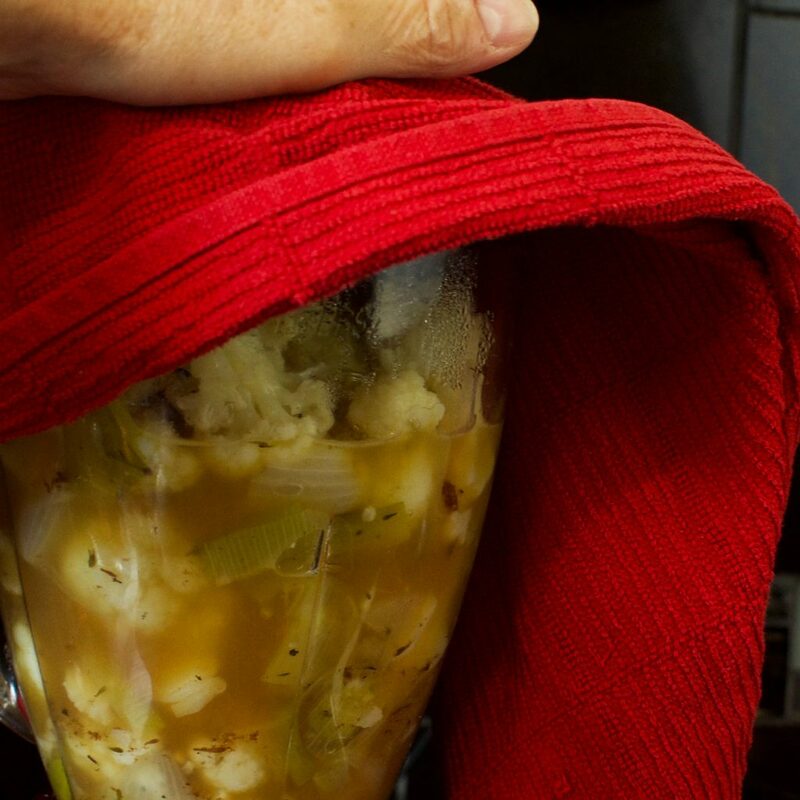 Simmer until cauliflower is very tender, about 12-14 minutes. 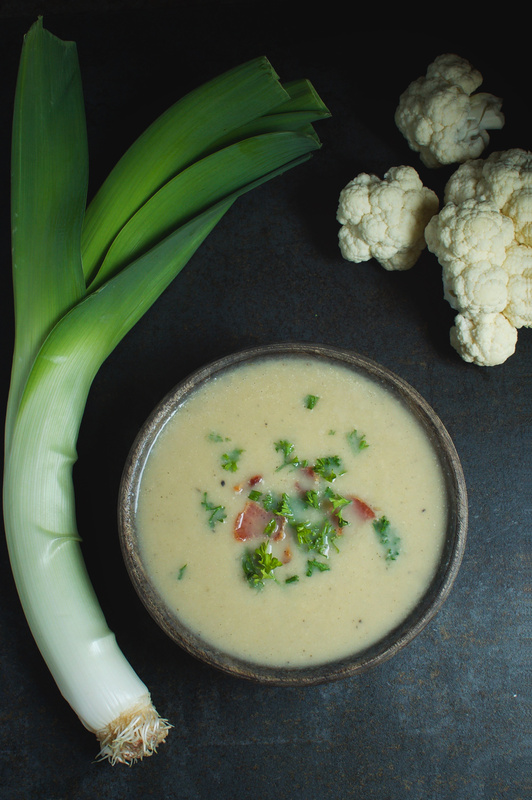 When cauliflower is soft, blend soup in batches in a blender or use and immersion blender to blend soup to a velvety texture. If using a blender, cover the top to prevent any escaping of the hot liquid. Return soup to stock pot if using the blender option. Stir in the remaining two cups of stock. Bring soup to a simmer. Remove from heat. Stir in salt and pepper. Taste and adjust seasoning. Stir in all but two tablespoons reserved bacon bits. Garnish with remaining bacon bits, a sprinkle of pepper and a sprig of fresh thyme if desired. If I have leftover soup, I freeze it in pint sized freezer safe canning jars. It makes a perfect quick lunch. Yum, this sounds perfect for a chilly winter dinner recipe! I can’t wait to try it! This does look really tasty! A nice twist on a classic. Pinning! What bloggers use really depends on what they use for a website builder. I use wordpress and they have so many plugins (pre-coded customizing options that you can download) that html coding is only necessary if you want to make your site look really different from the theme or add in something small that might not be possible otherwise. If you’re planning on starting a blog, I would really recommend self hosting and using wordpress because it’s easy enough to set up without coding knowledge, but still leaves you with the ability to customize as much as you’d like. Hope this helps! 4 quarts of chicken stock? Is that correct? Yes. I make my own stock and freeze it in gallon sized portions for soup and I often use a full gallon for soup. This recipe makes a lot of soup. I love having the leftovers and reheat them for lunches. If you prefer, you could cut the recipe in half. I tried this tonight and the soup came out really watery, not even a little thick. The soup in your picture looks more puree. What did I do wrong?? My 2 heads of cauliflower were too small?? It still taste good though!! 🙂 Thanks!!! Sorry it came out watery! There are several things that could have happened. First, did you puree the soup in a blender? It’s the pureed veggies that give this soup its thickness. 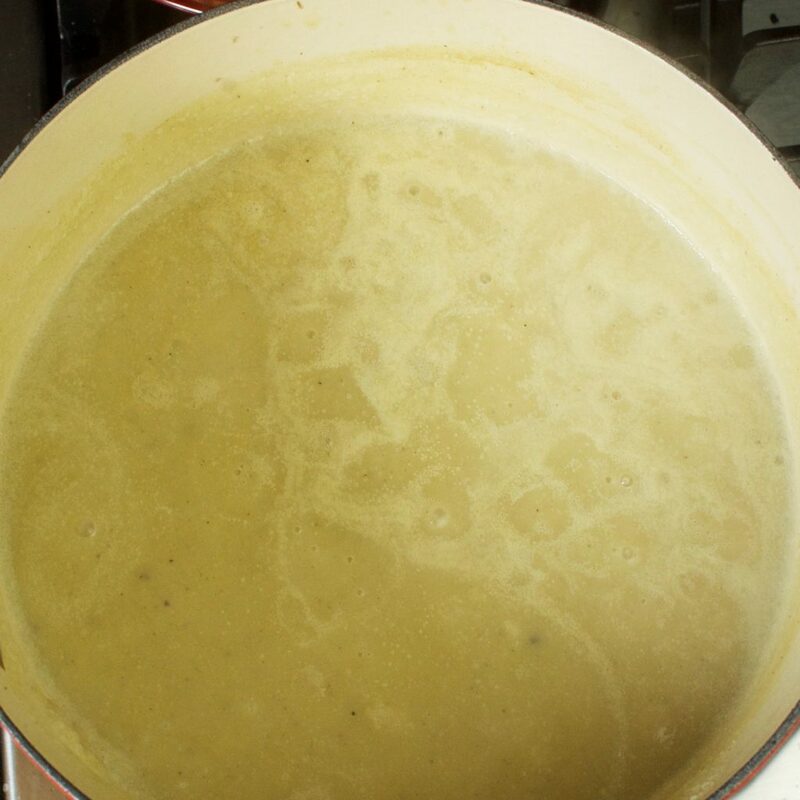 The onions, cauliflower and leeks all add to the thickness of the soup. If you left any of these out, or if any of them were very small, the soup might be thinner. I’m glad it still tasted good! Thanks for getting back to me so quick!! I used an immersion blender to blend everything. I used all ingredients so not sure what happened but will still definitely make this again. I’ll just have to grab bigger cauliflower and leeks and see if that will do the trick. Thanks again for the quick reply and delicious recipe!!! 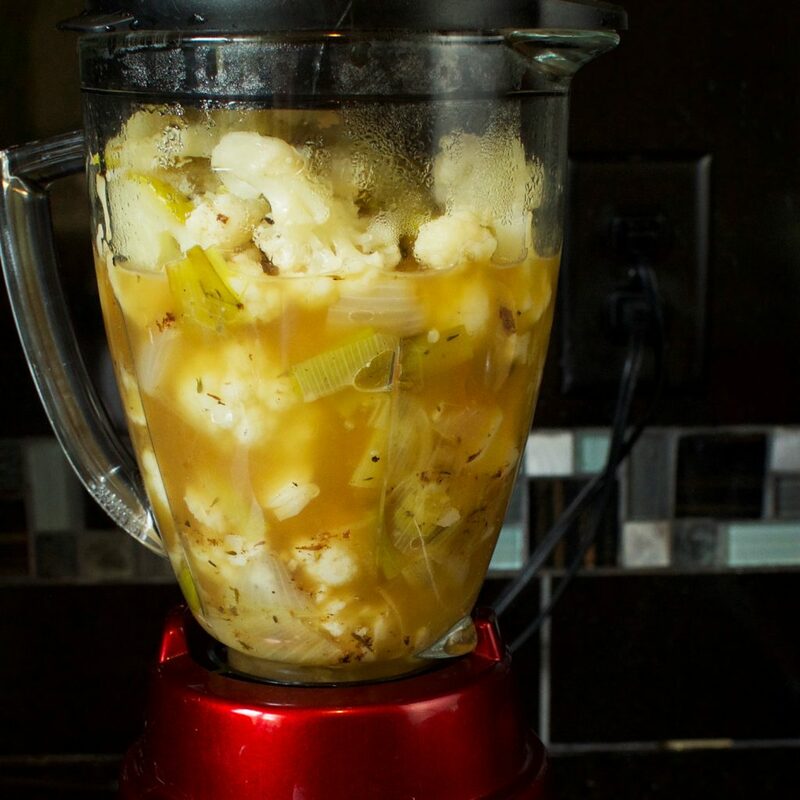 Based on the previous writer….I didn’t blend the leek and onion, only the cauliflower and enjoyed the bite! Thanks for a delicious recipe! Glad you enjoyed it! Thanks for the feedback! 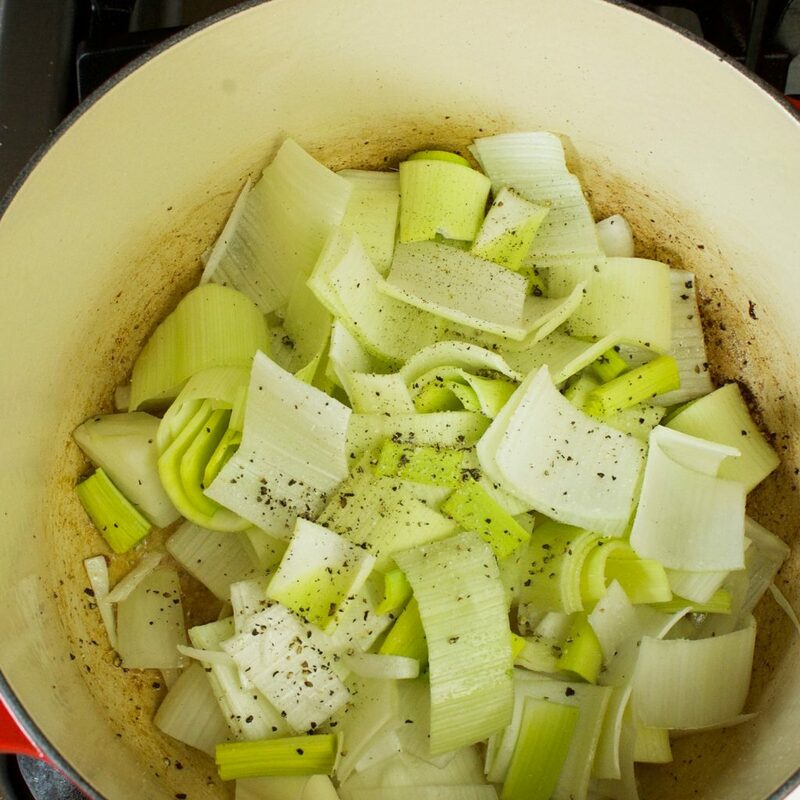 A very easy & delicious alternative to traditional leek & potato. I didn’t bother with the bacon. As long as you’ve a good chicken stock the extra calories from bacon aren’t needed for flavour. I also added 10 or so chill flakes. You can’t taste the spice but it amps the flavours a bit. Will make again for sure. Glad you liked it! Do you make your own chicken stock? I love homemade stock.Thanks for your feedback! I can’t wait to try this soup. I’m a little confused on how much broth to get. Recipe calls for one and half quarts divided. that’s 4 and half cups. Instructions say use one quart then later add remainder two cups. That’s six cups. I updated this recipe last summer because the recipe was a huge batch. I decreased the batch size, so the broth amount is less now. I may try to delete that comment so that it doesn’t confuse others. There are four cups in a quart (so 2 cups in 1/2 quart), so 1 1/2 quarts makes six cups. Let me know if you have any other questions. I used half a pack of bacon, one onion, two leeks, a large head of cauliflower and 8 cups of homemade turkey stock. It turned out great. Not thick like a potato based soup would be but more ‘velvety’. Would make this again for sure especially as I’m avoiding carbs. I just finished making this recipe this is WONDERFUl And low carb I love it Delish!!!! Just made this with a small variation. I roasted the cauliflower and leek and used smoked salt. It is so rich and delicious. Thank you so much for this recipe. It’s fantastic!